When autism comes into your home, your entire world shifts. We know this, just as you do. Any parent of children considered “special” because their needs are greater than those of “normal” children knows this. We navigate this shifted reality daily. As the parent of a child diagnosed with autism spectrum disorder you worry, you research, you set new goals and milestones. You schedule therapies and appointments. You get less sleep and childhood passes in a rushed blur of trying to do the best you can for your child. When autism enters your home, you are also a confirmed member of an amazing community of people who come together and support each other. And inside this community, you also learn a new reality, through your own experiences or the experiences of your comrades. With your comrades, you are on the continual hunt for resources to help your children with autism spectrum disorder. 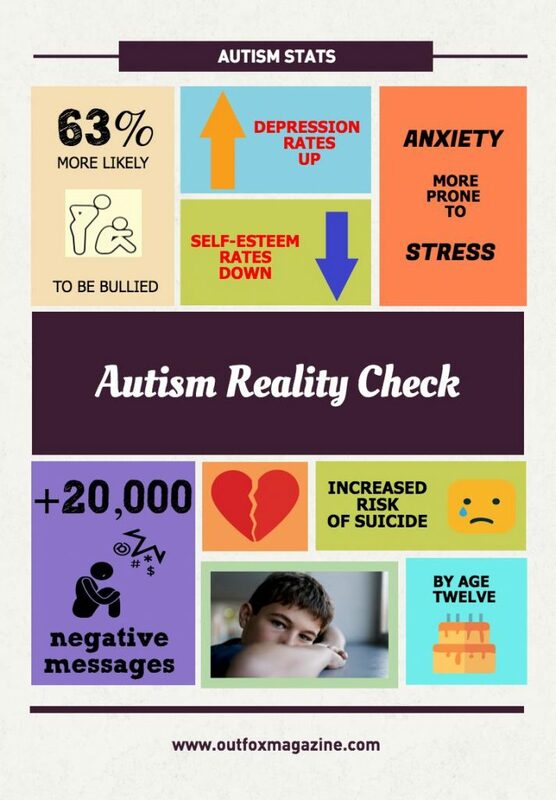 Facing the reality of autism is scary, isn’t it? In addition to the above, statistics suggest your teenager and young adult will also have higher rates of suicide. As the prevalence of autism continues to rise, more parents will join the battle to beat these odds. We need to raise awareness about the world of the child with autism. We need the whole community’s hearts to grow so that all children can grow into their full potential. We need to ensure that our children — the children with autism spectrum disorder — reach their full potential without blight. We need to raise children who have healthy self-esteem, who don’t feel left out, different, or alienated. And that is our mission at Outfox Magazine: a great new resource for children with autism spectrum disorder. It is a resource for children with ASD, not just about them. “There’s nothing like it” from a social worker and “It’s a happy, happy magazine” from a reader. Outfox Magazine — There’s Nothing Like It! Packed with earth, science, space and animal facts, plus contests, puzzles, puns, memes and jokes, Outfox Magazine devotes itself to building life skills and social skills while encouraging healthy lifestyles and healthy choices for children with ASD. It is an amazing resource for children with autism spectrum disorder. Each month Outfox Magazine will feature an interview of a successful person on the autism spectrum. This ASD Superstar will share their path to success and hurdles they overcame. Each month a panel of your children’s peers — kids just a bit older than them who have ASD and co-conditions — read their questions and use their own experience to provide advice. The magazine focuses on and encourages strength. Outfox Magazine is highly graphic and colourful, designed to catch the eyes and retain the attention of the child. Outfox is about building a community around our readers andshowcasing that they are not alone on their path and that success is not out of reach. 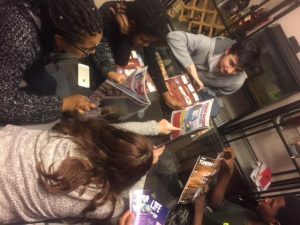 We have the celebrated comics from Face Value Comics working on an original, epic comic strip for the magazine that will feature an ASD hero and characters that are each unique and diverse. We have attracted exceptional talent to work with us: a creative graphic design and layout person, fabulous teachers and autism specialists, plus educators with specialist backgrounds and in-tune writers and illustrators. We at Outfox Magazine value diversity and will maintain a commitment to an inclusive environment. We have actively sought to include people on the spectrum as part of our wonderfully collaborative team. But we cannot do this without you. There is the African saying that it takes a village to raise a child, and it’ll take more than us to optimize the potential of this new resource for children with autism spectrum disorder. Subscribe to Outfox Magazine now, for your own child, or the ASD child you love. Subscribe on behalf of your students or your community. Purchasing a subscription for an “autism family” close to you, or for your child’s school, or doctor’s reception office; purchase one for the community library. Or donate money to the development of Outfox Magazine to help it become the best it can be. To help it to do the most it can do for the ASD child in your life or your world. Outfox Magazine is being produced on the kitchen tables of its two founders, in local cafes where we meet our designers and local supporters. Your help is needed. Outfox Magazine is custom-designed to inspire, celebrate, encourage and just plain old welcome and accept children with autism spectrum disorder. To let them know, in the words of February’s 16-year-old ASD Superstar, Skip (aka Autistic_Mind): you got this!